The Falcons trade away promising backup Matt Schaub -- who some believe will develop into a great NFL passer -- to Houston. Michael Vick becomes embroiled in dogfighting conspiracy; is now set to plead guilty to charges and will probably never play in Atlanta (and may never step onto an NFL field) again. Friday, another Falcons QB -- D.J. Shockley -- tears his ACL and is out for the season. A young, tuna-steak raw Brett Favre was more or less completely overlooked during a brief stint in Atlanta. Chris Miller was talented but infuriatingly fragile. Billy Joe Tolliver was mainly just known for having a silly name. Bobby Hebert never seemed to belong anywhere other than New Orleans. Jeff George was talented but surly and didn't seem to know how to win. Browning Nagle was named Browning Nagle -- a name that sounds like it could describe a uniquely mesmerizing formation for a turd (check it out -- I just left a Browning Nagle in your toilet). All of this of course begs the question: Is the Falcons QB position cursed? 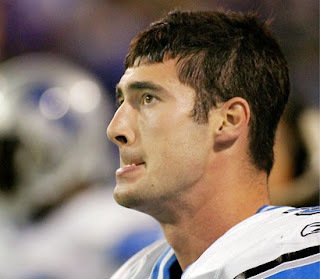 If it is cursed, that cannot bode well for the chances of new Falcons starter Joey Harrington, a great college player who has had a fairly miserable NFL career. Given Harrington's general inability to catch a break (or make his own breaks), is anyone else concerned about his well-being and general safety? In particular, if Harrington does somehow harness his talent and begin to play well, the Falcons should absolutely not let him out on the field in anything other than a full suit of chain mail. Because you just know that if Harrington does improbably start throwing the ball efficiently, his right arm is going to get severed off in a bizarre backfield collision and go helicoptering into the stands, giving one confused young fan an unexpected souvenir that he goes home and frames in a glass case, only to have the haunted, dismembered limb bring him a lifetime of brutal misfortune. Would You Kindly Remove Those Fangs from My Head?